Pulses are incredibly healthy and good value because they can make your meals go that bit further. Make sure you keep a few packets in your storecupboard, and if you’re not sure what to do with them, read on..
Use less meat in dishes and add beans, chickpeas or lentils instead to bulk out stews, soups and pies – you might discover one meal that normally feeds four has enough left over for lunch or even a family meal the following day. Toss beans into salads. Beans can transform leafy salads into substantial meals. Try cannellini beans with halved cherry tomatoes, rocket leaves, chopped parsley and a garlicky dressing; or a Mexican-style salad using kidney beans, sweetcorn, chopped avocado, coriander, red onion and a pinch of chilli. Mash some butter beans with garlic and olive oil as an alternative to mashed potato. A daily portion of beans provides good amounts of fibre and protein – a satisfying combination. 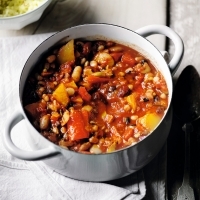 Beans and pulses count towards your 5 a day. Help boost your daily intake by including beans in one of your meals each day. Try having beans on toast or with a baked potato. Alternatively, fold through a rice salad.